Hazle Ceramics are gearing up for Christmas with the release of ‘Coming home for Christmas’ a Limited Painting of just 60 models. This enchanting piece is priced at £79.95. Christmas is on it’s way once again, and this year we present a Limited Painting based on the good old fashioned family Christmas we all want to enjoy! A grand Christmas tree & Dad (or Grandad!) dressed as Santa can be seen in the downstairs windows, while garlands, carriage lights and icicle lights decorate the outside, with Christmas reindeer and pots of poinsettias round the doorway. 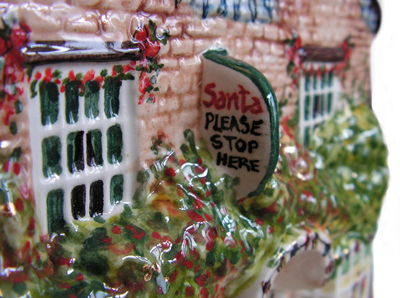 Our inspiration for Limited Paintings come from many sources…this ceramic is based on a one-off painting we were commissioned to create by British Collector Michael Woods, Michael has an impressive collection of ‘Nation of Shopkeepers’ pieces, and wanted something truly ‘Christmassy’ to add to his High Street. As soon as we saw the piece coming to life, we fell in love with the idea, and wanted to produce it as our Christmas Limited Edition for 2013…So Thank You Michael, all credit to you for this great idea. 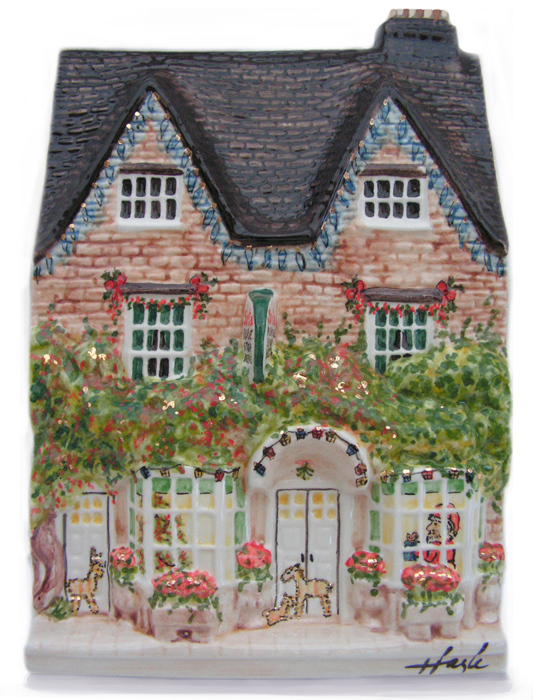 ‘Coming home for Christmas’ is painted and embellished with 22ct gold on our Wisteria Tea Rooms Building, this pretty building is based on a 16th Century Cotswold Stone Hotel and Restaurant in Woodstock, Oxfordshire, near to Blenheim Palace, and measures 18cm (7″) tall to the top of the chimney x 12cm (4 & 3/4″) wide. ‘Coming home for Christmas’ is a Limited Painting of just 60 ceramics, and priced at £79.95 each plus postage/insurance. Each ceramic will be numbered and accompanied by it’s own certificate, signed by Hazle. For more information visit http://www.hazle.com.